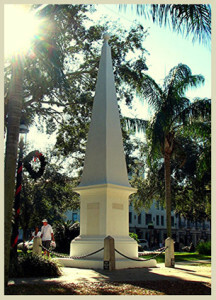 FSU Art Faculty Kevin Curry is selected to participate in a temporary, international public art initiative of Compassionate St. Augustine, Obelisk Art 450 (OA450) seeks to pay tribute to the 450th anniversary of the nation’s oldest city in 2015 and promote a legacy of compassion. Compassionate St. Augustine is a nonprofit organization based on the four pillars of freedom, democracy, human rights and compassion. 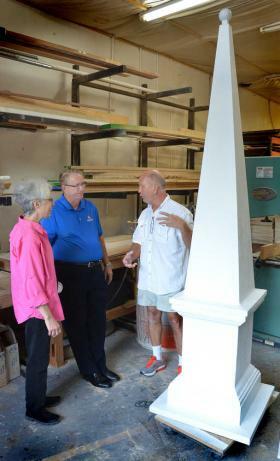 Up to 25 renowned artists who exhibit regionally, nationally and internationally are selected to create an artwork on the blank canvas of an 8.5-foot tall obelisk replica of the Monumento a la Constitución on the St. Augustine’s Plaza de la Constitucion. Each artist will have their own obelisk to work with that will be placed on a historic site within downtown St. Augustine.